Put the XLS adjustable spacer pipette's 6 or 8 nozzles to work and efficiently transfer samples between different sized formats with exceptional comfort. Its speed, ease and accuracy make it ideal for Genomic, Proteomic, Tissue Culture and Cell Culture applications. For example, aspirate samples from micro-centrifuge tubes, turn the spacing knob, and dispense into a 24, 48, or 96-well plate. Lightweight and designed for use with either hand, the reliable XLS is among the most ergonomic adjustable spacer pipettes available. The carefully shaped fingerhook enables a relaxed grip. New elastomeric seals and polymer tip ejectors, along with Rainin's patented LTSTM LiteTouch SystemTM, deliver smoothness and control. The sure-fit handle, light springs and "stiction-less" sealing technology ensure smooth, light operation and significantly reduce the risk of repetitive strain injuries. LTS tip and nozzle design make mounting multichannel tips exceptionally easy. Get perfect sealing – first time, every time – without rocking or hand-tightening. Try it – you'll be amazed how easy it is to get absolutely consistent sample pickup across all channels. And with LTS, tip ejection force is just 0.6 kg. Service records, cycles and status data are recorded to the XLS pipette's embedded RFID tag and are completely tamper proof, in full compliance with GLP/GMP standards. With accuracy and precision that is better than or equal to other premium pipette brands, XLS pipettes deliver data you can trust. With 5 models to choose from, Pipet-Lite XLS Adjustable Spacers pipettes offer a pipetting range from 5-1200 μL. A continuously variable spacing mechanism lets you quickly set spacing between the channels to any value between 9 and 19 mm (6 channels) or 9 and 14 mm (8 channels), at the same time ensuring identical spacing between all channels. Patented LTS tip and nozzle design provides exceptionally easy multichannel tip mounting. Perfect sealing – first time, every time – without rocking or hand-tightening. Try it – you’ll be amazed how easy it is to get absolutely consistent sample pickup across all channels. Two controls, Limit and Spacing,allow smooth, precise and lockable adjustment. Set the desired spacing with the Limit control and change to the set point with the Spacing control. Easy-to-read millimeter scale provides a visual aid to spacing without guessing. XLS pipettes were the world's first to be equipped with Radio Frequency Identification (RFID) chips for storing service and data profiles on-board, tracking calibration data and managing pipette inventory. With every Quote request you get a free assessment of your pipetting risks and get some useful hints on reducing these risks. XLS pipette is designed for easy autoclaving where it counts: the complete liquid end, including the seals. The shaft and tip ejectors are easy to remove and autoclaving won't compromise performance or feel. Patented LTS tip and nozzle design make mounting multichannel tips exceptionally easy. Perfect sealing – first time, every time – without rocking or hand-tightening. Try it – you’ll be amazed how easy it is to get absolutely consistent sample pickup across all channels. 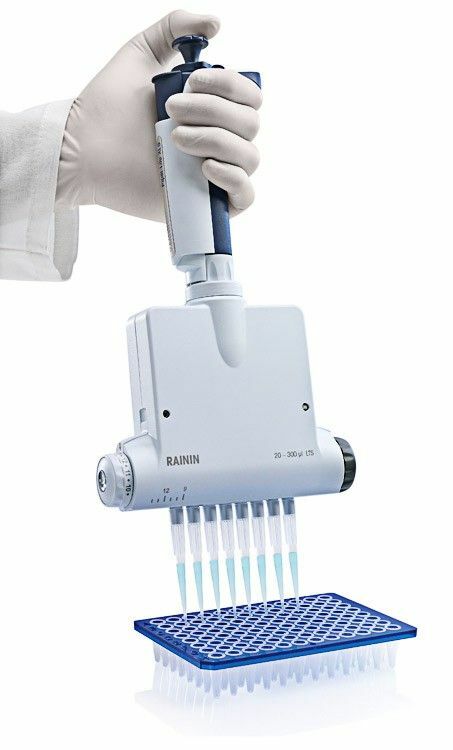 Speed up your plate work with Rainin’s E4 XLS electronic adjustable spacer pipettes. Special modes streamline how you transfer multiple aliquots, perform serial dilutions and program complex pipetting routines. Operating instructions for the Rainin Pipet-Lite XLS+ single-channel, multichannel. and adjustable spacer manual pipettes. This document provides an overview of how the XLS+ multichannel pipettes raise the bar on multichannel pipetting and performance. An overview of the features and benefits of the XLS+ pipette family, including performance, comfort and control.